Cyber-crimes dominate the news on almost a daily basis and are perpetrated by master computer criminals who are not only after your credit card numbers, but your personal data as well. All of what they steal can be sold on the dark web for a handsome profit. These criminals are generally not your nerdy teen next door, but more often are members of sophisticated crime syndicates that patiently look for flaws in their target’s computer security system – and there are always flaws – and steal whatever is valuable. The security of our nation is dependent on our ability to defend our underlying computer infrastructure from both criminals and hostile nation-states who wish to steal our money, intellectual property and develop capabilities to destroy vital services. To combat these threats the nation is in dire need of computer security professionals. It is estimated that more than 200,000 cyber security jobs in the US are currently unfilled. These jobs range in pay from $50,000 a year upward to $140,000. The United States Air Force Association recognized the burgeoning threat to national security and created a program to enliven an interest in cybersecurity among our nations youth. The program they developed is called CyberPatriot and involves a series of security competitions that leads to a national finals event. In 2017, there were more than 5,000 teams from across the country that competed in the rounds prior to finals. The program has the backing of sponsors such as Northrop Grumman, CISCO, Boeing, Facebook and the Department of Homeland Security to name a few. During the competition teams are given computer systems that have security flaws that they must identify and fix. They are also tasked with building and configuring a computer network. This means not only connecting the devices together, but also programming the various network devices so each communicates as it should. Teams have six hours to harden their systems and complete the networking tasks. Teams must find and fix flaws to accumulate points. Over the series of four competitions, the teams with the highest points are selected for nationals. These teams earn an all-expense paid trip to the national competition held in Baltimore Maryland and have a chance to win recognition and college scholarships. Students who have an interest in computers, solving puzzles or are just curious about technology are drawn to participate in CyberPatriot. To compete successfully they must learn real-world, marketable, skills. And, just as you might predict, many go on to college to earn computer and security related degrees. 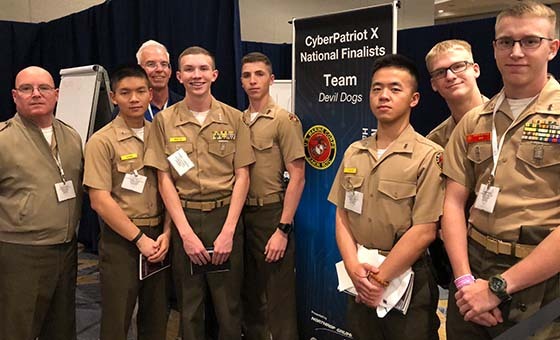 The Marine Military Academy in Harlingen, Texas has participated in the CyberPatriot program since 2014 and has attend the national competition four out of those five years. Most recently MMA’s six-member 2018 team participated in the national competition. For one team member it was his fourth time attending nationals and had been involved in the program for five years starting in 8th grade. Beyond generating an interest in computer security, CyberPatriot also develops a student’s critical thinking and team skills which are highly valued in today’s work force.